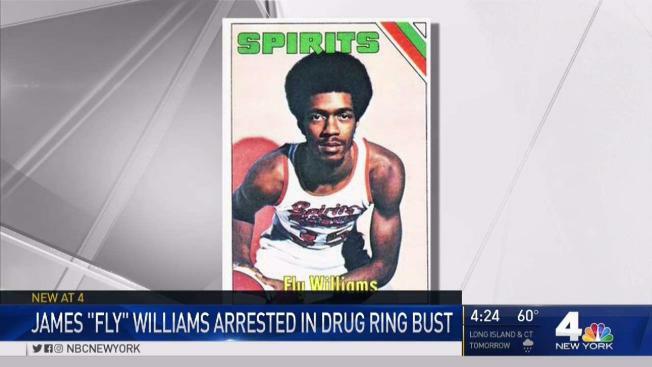 Former NCAA and ABA basketballer James "Fly" Williams was the kingpin, police say. A former New York City basketball star was arrested in a drug raid after a months-long investigation in which he allegedly distributed over 2 million glassines of heroin in Brooklyn in a three-month period, authorities say. Former NCAA and ABA basketballer James "Fly" Williams, 65, directed the operation, and a dozen other people helped cut and move the drugs and hide the proceeds, prosecutors say. The heroin was purchased from suppliers in the Bronx and re-sold in Brooklyn neighborhoods including Brownsville, Bushwick, Flatbush and Fort Greene, according to prosecutors. Many of the transactions took place in the area of the Brownsville Recreation Center on Linden Boulevard. The investigation into Williams started last September, and police made undercover buys, monitored the suspects, both physically and electronically. Between late January and late April, the drug ring circulated about 2 million glassine bags of heroin, prosecutors said. A bag typically has a street value of between $6 and $10. When authorities conducted a search warrant Wednesday, they found six guns, over $185,000 in cash, about 2 kilos of heroin and an additional 13,667 glassines. Williams was a 6-foot-5 shooting guard out of James Madison High School in Brownsville and attended Austin Peay University in Texas in 1972 before playing in pro basketball's minor leagues and in Israel, according to The Daily News. He frequented street basketball games while growing up in the city, and Sports Illustrated has called him one of Rucker Park's streetball legends. Williams struggled with unemployment, and has been shot four times over the years and served at least two prison terms for attempted robbery and drug possession, according to The Daily News. In the late 1990s, he spoke to kids to warn them away from drugs. In addition to Williams, Jeffrey "Doobie" Britt, 34; Hanziel "Johnny" Martinez Cintron, 39; and Richard "Christiano" Rivera, 45, were arrested on drug sales and possession charges. Nine others are facing varying charges in the alleged heroin distribution operation, and aditional arrests are expected. Attorney information for the suspects wasn't immediately clear.